This will be my last monthly recap for 2015. I am actually excited to start doing my recaps for the New Year. 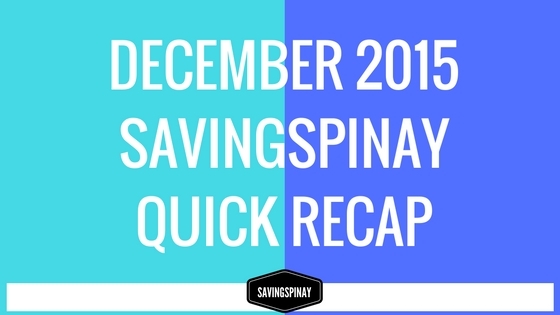 2015 has been a great year for SavingsPinay and before revealing what had happened for the past month I decided to also include in this post my year-end review. My 2015 Personal Goals is a mixture of success and failure. I wasn’t able to get my SSS, Passport and Driver’s License which I promise to get before 2015 ended. I also wasn’t able to hit a 6-digit mark in SavingsPinay though I am forever thankful with the 96,000++ views we had as the year ended. I am so fortunate for the increase of followers in my Facebook Page, YouTube Channel and RSS Feed. I also gathered a more solid readership in IzzaGlino. I got a lot of sponsored post inquiries and actual sponsored post opportunities on my blogs. Details were published in My Extra Income Year-End Report. I was able to gathered booked events in 2015 but not as much as as I intended it to be. The year was also meant for overspending and as much as I want to put my money on staple pieces I wasn’t able to control my spending. My 21 and Better List was a big failure of 2015. I literally didn’t fulfill what’s on my list. As what I’ve said on My Financial and Personal Goals Year-End Review I undergone major changes on my Financial Goals. Instead of a COL Investment Plan I focused on getting a St, Peter Plan. Both the Fun Fund and Emergency Fund wasn’t accomplished consistently due to overspending on my part. However, I was able to successfully build an extra income streams through freelance content writing and paid opportunities through my blog and YouTube Channel. The rest of my financial goals didn’t push through but I am still in full hope of the promise 2015 has to offer. I did a post entitled My Must Do’s Before 2015 Ends and here’s the breakdown of what happened to the said to do’s. I replaced this goal with the SavingsPinay 12-Month Money Makeover Program. Though I didn’t pursue with a new eBook this year I am still positive that the 12-Month Makeover Program will bring the same effect to the SavingsPinay Readers. You can still submit your email on the top left corner of the webpage above my bio. This didn’t push through for I had a little struggle allocating my savings. I also realized that its not the best time to invest on the later part of the year because I feel less motivated to do so. It’s still part of my 2016 goals to invest in a new investment vehicle though. One must do of 2015 which I regret I didn’t fulfill. Blame it on me procrastinating as always. I already filled up the form but wasn’t able to go to the nearby SSS Office to finish my application. 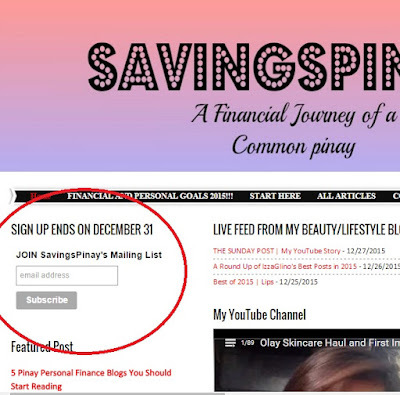 I did change the header bu including the SavingsPinay FB Group link which I encourage you to join because it would be active in 2016. I also did a START HERE page which will guide you on where to start if ever you are new to SavingsPinay. I put it in progress mode because I still have to tweak a little on the pages. I can’t wait to share the pages to you! The posts that will be published in January are all planned now and all I have to do is find time to create the posts and publish it on the blog. I am now one-month advance in planning my posts which is a big progress though I have yet to complete the whole year editorial calendar. By November I was able to purchase a makeup storage which makes me so much happy. I now have a proper storage to my growing makeup collection. I’ve already filmed the Makeup Collection video but due to time constraint I didn’t upload it. Instead the last video for 2015 was my December Favorites + What I Got for Christmas. The headers over my personal beauty and lifestyle blog IzzaGlino are now much better. I put the topics I blog about plus a Start Here and About Me which makes it more nice to read through. Slowly but surely I am deleting apps that have no significance on my Iphone and Ipad. I hope to finish sorting everything before Monday, January 4. Finally I was able to delete massive amount of pictures that takes up a lot of space on my phone. This travel goal wasn’t able to push through but will definitely be done this new year. You can read my Personal and Financial Goals for 2016 if you want to stay updated on my objectives this year which I hope will have more COMPLETE status than POSTPONE and IN PROGRESS. 1. Finished 2015 with 96,700++ Pageviews. Though we weren’t able to reach the 6-digit mark I am still so thankful for all the love and support you’ve showered over my humble blog. Reaching almost 100,000 pageviews for the past two years that I’ve been actively blogging is such an honor. Hope you’ll continue to support. 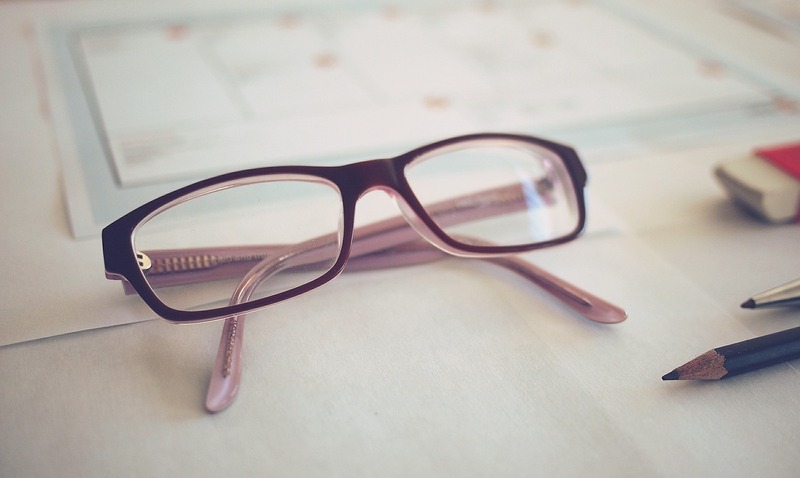 For the last series of 2015 I did an in-depth posts on Intentional Living. This has been the very life I want to live in 2016. Something focused and meaningful. I don’t want another year to be wasted without reaching any of my goals. 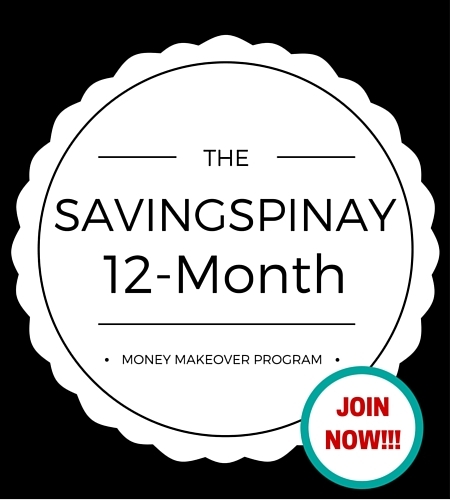 If you also want to live anew this 2016 I urge you to follow through my 3-Day December SavingsPinay Series. 3. Attended #iBlog 11 2-Day Blogging Summit. This is one event that I will be forever thankful that I attended. It was last December 4 and 5 and I am really fortunate that I found the link to join the program. It was for free plus we have were given free food and freebies from sponsors too. If you want to know more about my experience click HERE. How did your 2015 went?